The fields of application for the horizontal peeler centrifuge are as well in the chemical and Geometrical and functional comparison of the design of the Krettek horizontal peelerpharmaceutical as in the starch and basic industry. The multi-purpose possible application of our centrifugal system implicates, that no general batch cycle can be described. Rather the user has to define the optimal process by means of his product and process experiences. Of couse we are quite willing to support with our experiences. Subsequent a batch cycle will be exemplary described. Therefore it has no universal validity. 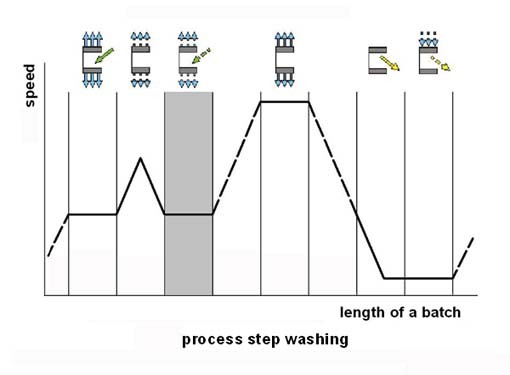 The single process steps are as a rule the filling process, followed by intermediate spinning and afterwards washing. Both last-mentiond steps will be carried out severalfold depending on requirement resp. impurities- if necessary with different washing media. 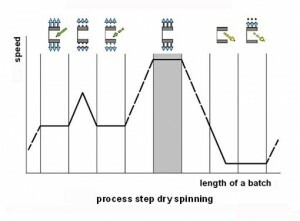 The washing process is followed by a dry spinning step again with increased speed and finally the discharging of the sieve basket than again at reduced speed. Product resp. user specific a heel cake removal step follows in a more or less fixed rhythm. 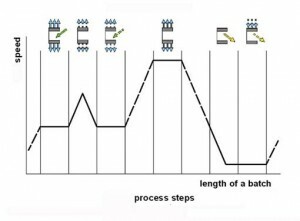 This process step will be carried out at a highly reduced speed. The horizontal peeler centrifuges type PharmaCent work discontinuously and fully automatic. The first production step is the filling of the centrifuge. Here the sieve basket of the centrifuge will be filled with suspension via the feed valve out of the priming vessel after acceleration to filling speed. It is the aim to reach an even unbalance free distribution of the suspension. The filling speed will be adjusted in that way, that solid bridges can build up due to the filter medium which is optimal adapted to the solid. In the further process the solid bridges will be covered by a disperse and porous aggregate material with a nearly perfect cylindrical profile (the selected pore diameters of the filter medium comply with the feed concentration. At high feed concentration the pores should be selected bigger than the particle diameter. The solid particles which will be held back at the edge of the pores just before the filter medium, grow together in this case to solid bridges and build up a mixture of solids, which prevent the further penetration of solids. At low feed concentration however fine pored filter mediums with a diameter below the particle size spectrum are recommended. Otherwise the separation efficiency will decrease or in the case of conformity with the pore diameter there is a risk of blockage. After the filling process is finished an intermediate spinning process can be carried out just before the washing step. Usually an equal resp. higher speed than the filling speed will be selected. In any case the process must be caried out in that way, that the cake do not start to dry on the surface. That means the process must be stopped before the liquid level of the covered filling suspension penetrates the cake. Otherwise it implicates an increased inherence of impurities at the solid particles. Further it has to be noted, that very often by the intermediate spinning there is a risk of crack formation just by compressible aggregate material of solids. This implicates that the washing liquid pass uncontrolled the filtercake across the crater and crack formation. The result would be an ineffectual washing process and/or an essentially higher increase of the washing medium. For this reason, too, the processing step intermediate spinning has to be reconsidered very critically. If the general separation of solid and liquid inside the centrifuge is carried out, many products of the chemical and particularly of the pharmaceutical industry has to be subjected to a washing process. For this purpose the pre-formed and partly dehumidified filtercake will be fed with washing medium during rotation. This medium ideally flow steady through the filtercake (flow-through washing). (Another process engineering possibility is the ‘dilution washing’, which however here will not be described in detail). The task in this process step is to remove the adherent purities at the solids and to wash out of the cake. It is important that initially the filter cake is saturated with mother liquor and that during the actual washing step the supply of the washing medium will be kept high in that way, that the filter cake stay covered completely with washing medium. Are very high purity of the product required, the washing medium is very cost-intensive and /or if the filter cake tends to crater formation, it is necessary to consider how far the processing advantages of the backflushing rotor are advantageous in an overall view. 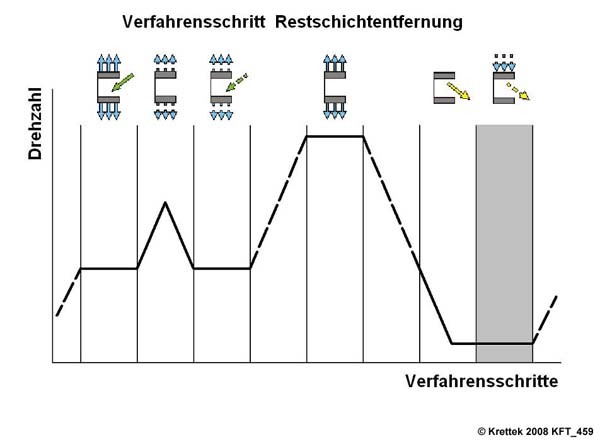 In the production of pharmaceutical products often the processed active ingredients prohibit the final thermal drying of the final residual moisture. Some of the compounds are thermo-labile, other change their colour when heating and then do not meet the strict quality requirements. 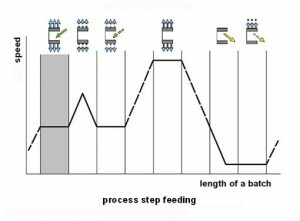 In many applications a further dehumidification forms a pourable and compact filter cake, in which as a result the shear forces effected by the peeler during discharging minimized the risk to generate a thixotropic or dilatant behaviour. Above all, however, particularly ultra-fine material can be treated effectively with regard to the high g-force-factor. The processing of ultra-fine particles with high functional properties increase in recent time the production of pharmaceutical products considerably. However with the decreasing particle size the density of the pore strongly increase and in the same time the size of the pores decrease. This generates that capillary fluid store up more and more inside the aggregate material of very fine solids given by the particle geometry and on the other hand this put up a higher resistance against the mechanical dehumidification. Moreover interstitial water deposites at the contact zone of the particles more and more because of the increase of the particle surface. This water can only be removed in the centrifugal field of force if the forces are strong enough to distort the interstices as far as they become unstable. 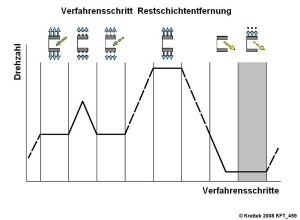 These previously described conditions increase the capillary rise which has to be overcome by the centrifugal forces within the framework of dehumidification. Therefore increased centrifugal forces are the prerequisites for an effective dehumidification of a filtercake with very fine particles and for a trouble-free and closed process for the production of active ingredients. A further increase of this factor, however, set invincible limits in big scale at present by the strength of the rotor, particularly of the sieve basket. The time factor does not affected the reachable grade of dehumidification very much, so that the increase of the dehumification time does not improve the result essentially. 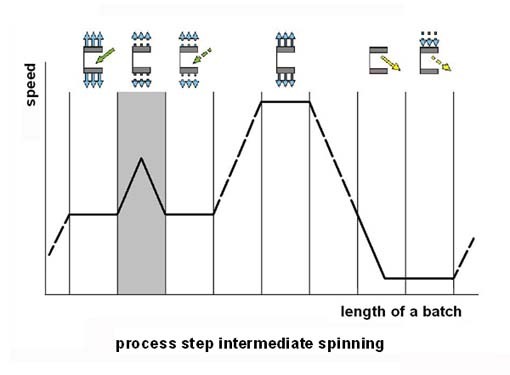 The spinning step has to be regarded as finsihed if the state of equilibrium of the saturation process is reached. In this context , moreover, is has to be noticed, that many aggregate material of very fine solids take a pasty consistence if the moisture slightly increase . This implicates that the resistance, in opposite to the further process, strongly increase. For this reason, too, a permanent steady dehumification is most favourable refer to a trouble-free production process. 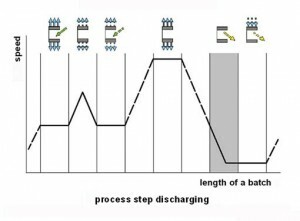 The discharging speed will mainly be limited up and also down by two factors. On the one hand by changes of the product characteristics due to the selected discharge speed and on the other hand by the machine design (vertical or horizontal position as well as by the components strength). 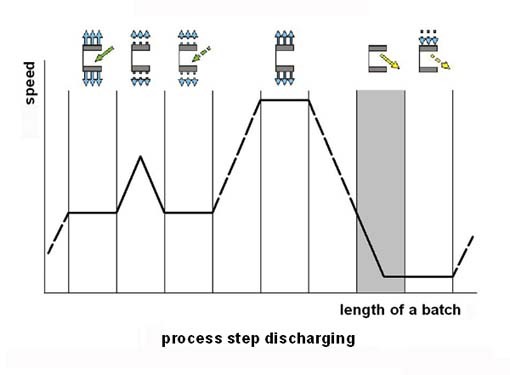 Under the economic point of view a discharge speed as high as possible is to be aspired, at which, however, no unacceptable product change takes place. Due to huge numbers of different products which are processed on horizontal peeler centrifuges no general statement can be made to this point. So e.g. a crystal break, which takes place when discharging with high speed, is negligible in many cases for intermediate products, because afterwards, these products will be dissolved on a large scale. Also products are known, where the effect of a high peeling energy is an indispensable requirement for a further reduction, so e.g. for the wanted destruction of agglomerates. 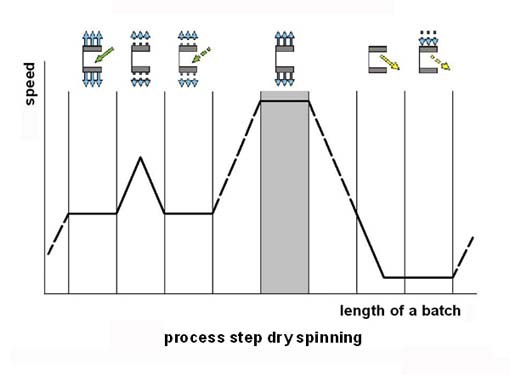 These examples show that there is an urgent necessity to choose a centrifuge design which enables a crystal-protected discharge, on the other hand, however, should have the flexibility to find high shearing forces. Independent of this, a discharge with high speed results in an essentially gain of time. The Krettek Know-How enables both – a discharge at a low speed, also due to the use of modern, high-performanced frequency converter technology, on the other hand also high discharge speeds due to the solid design concept. 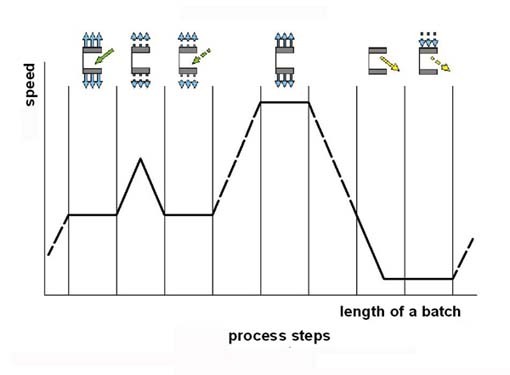 In this example the discharging step starts in the last third of the breaking phase, i.e., already at very reduced speed. For that purpose the knife of the combined function unit will be electromechanically swivelled in the solid cake. The discharged particles will be fed in the chute inclined at a steep angle supported by the fluidic favourable design. The forward speed of the knife is very easy fully adjustable by changing the frequency of the drive of the linear actuator. Reaching the pre-adjusted discharging level, the knife remain in this position refer to the pre-selected dwell-time. The reverse motion happens with high speed. The combined function unit is designed as a pivoting peeling device for reaching an optimal sealing technology. In the pharmaceutical industry, where outermost cleanness and sterility is required, exclusion of cross-contamination and traceability of the batches are further important criteria. That’s why a fully automatic residual heel cake removal is a must. A double-sided working blow-off-system is used. This pneumatic discharging of the solids will be simplified by the reduced residual moistures of the filtercake, system related realized by the higher g-force-factor of the Krettek horizontal peeler centrifuge.To reach the requested effect nitrogen with a pressure of 6 – 7 bar will be blowed into the bore holes in the basket wall via nozzles located at the backside of the basket wall. Herby the filter cloth of the filterelement system „Confect“ will be stimulated to flutter which effected a breaking and removing of the heel cake. This process can be supported by an additional nozzle lance at the backside of the knife bar. Most favourable the sieve basket rotated at this with a peripheral speed of about 3 – 6 m/s.The heel cake will be discharged by the knife into the chute inclined at a steep angle.